En esta lección se va a explicar el uso y gramática que se sigue para expresar oraciones con "used to". En esencia la expresión "used to" va a ser usada para hablar acerca de hábitos del pasado o situaciones que son, a día de hoy, diferentes a cómo eran antes. 1.- You used to exercise every day. 2.- He used to live in USA. 3.- They used to like rap music. 1.- You didn't use to exercise every day. 2.- He didn't use to live in USA. 3.- They didn't use to like rap music. Recordemos que existen 2 tipos de preguntas: aquellas que se contestan Si / No y las que requieren una respuesta especifica. 1.- Did you use to exercise every day? 2.- Did he use to live in USA? 3.- Did they use to like rap music? 1.- When did you use to exercise? - I used to exercise on saturdays. 2.- Where did he use to live? - He used to live in USA. 3.- What music did they use to like? - They used to like rap music. Podemos concluir que la expresión "used to" nos ayuda a describir algo que en el pasado tomó lugar durante un específico periodo de tiempo y por ahora ya no continua. Con el objetivo de reforzar los conocimientos adquiridos con esta lección, se presenta un ejercicio práctico que va a ayudar a plantear distintos tipos de oraciones (ejemplos) concernientes a “used to”. El siguiente cuadro nos va a ayudar a plantear declaraciones (afirmativas y negativas) así como preguntas y respuestas para este tema. Los nombres de las personas son Jane y Richard; las actividades de las columnas refieren a actividades comunes que se realizan en la infancia. Jane used to play with dolls when she was a child. Richard used to collect stamps when he was a child. They used to watch cartoons when they were children. They didn't use to sleep with the lights on. 1.- Did Jane use to collect stamps? 2..- Did Richard use to watch cartoons? 3.- Did they use to watch cartoons? 4.- Did they use to play with dolls? 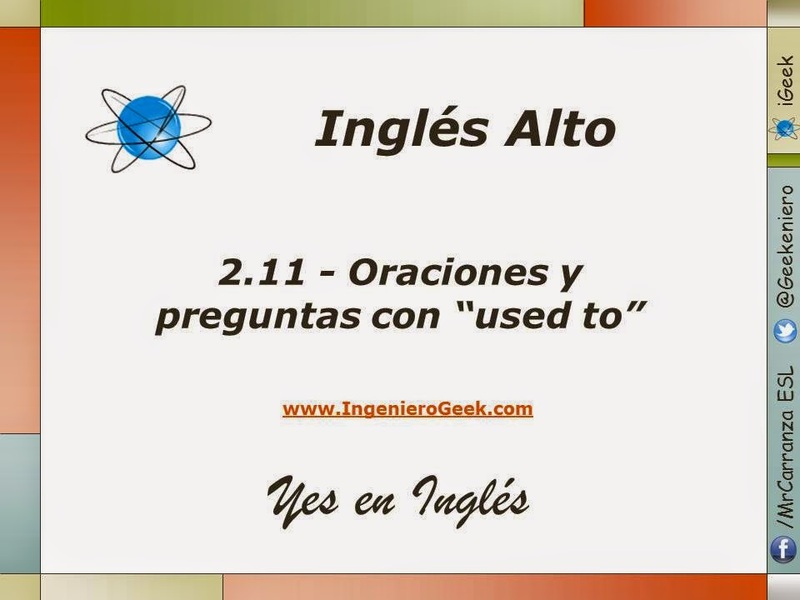 En este tema se ha visto un uso muy específico del inglés, la expresión "used to" para hablar de hábitos del pasado que en el presente son inexistentes. They used to work at that factory. He used to study before an exam. We used to eat ice cream every day. She didn't used to sing in the morning. We didn't used to eat pizza every weekend. I didn't used to work in the night. Did you use to play videogames? Did you use to read books? Did you use to live in the USA? Did you use to live in the USA ? I used to study in my bedroom. He used to play golf on Saturday. I used to buy chocalates before school. They dont ` t used to play football when it`s raining. They didn`t used to do their homework. She didn`t used to drink when she was at university. FRANCISCO ANTONIO AVIDA FABIAN 6IM SABATINO. I used to read every evening. They used to walk in the park. He used to sleep early after work. She didn't used to take the bus in the morning. He didn't used to play basketball. I didn't used to dine at home on the weekends. I used to play basketball every day after school. I used to go swimming on weekends. They used to sing in a choir. We didn't use to eat a lot of meat. She didn't use to go jogging. It didn't use to rain a lot. I used to play soccer on weekend. I used to go to church on saturday. I used to study before of the exam. She didn't used to wear jeans. He didn't used to play soccer. They didn't used to speak english. Did you used to play videogames? Did you used to read books? Did you used to live in the USA? She used to study before of the exam. He used to go to swimming on weekends. I used to singular in a choir. She didn't use to playa volleyball. I didn't use to dinero at home on the weekends. We didn't use to datos médium well. Did you used to real books? Did you used to libertad in the USA? 1.- I used to play football when I was small. 2.- They used to run when at the ranch. 3.- She used to go shopping to the market. 1.- He didn't used to work at the night. 2.- She didn't used to sleep early. 3.- I didn't used to run in the park the saturday. 1.- Did you used to play video games. 2.- Did you used to read books. 3.- Did you used to live in the USA. 2.- She used to play with your team. 3.- Mi sister and i used to watch the movies in the afternoon. 1.- My mom didn't used to arrive very night a home. 2.- My uncle didn't used to go to the church. 3.-The boy didn't used to be very tall.